PETA isn't thrilled about the 1-2-Switch milking minigame, or the upcoming milking challenge Nintendo has agreed to. Last week, Nintendo accepted a challenge from the Billings Farm & Museum in Vermont - a contest to see who can milk real cows the fastest. The challenge was issued in response to one of the Nintendo Switch's 1-2-Switch minigames in which players simulate milking a cow. "So Nintendo has a new game out called 1-2-Switch and we noticed it includes a cow milking game. We sent them a message inviting them out to our farm to show them how it's REALLY done and to school them at their own game," the farm's challenge read, in part. But it appears that the milking has also caught the attention of PETA (the People for the Ethical Treatment of Animals), and this was in a less lighthearted way. On Thursday, the organization shared their displeasure at both the minigame itself and the aforementioned real-life milking challenge. The displeasure was shared in the form of a letter sent to Nintendo and shared to Facebook. "Hey Nintendo-how about you show what REALLY happens to cows on dairy farms?" reads an accompanying post. "After Nintendo accepted a cow-milking challenge from Billings Farm & Museum, we couldn't stay silent. This letter from PETA president Ingrid Newkirk spells it out." 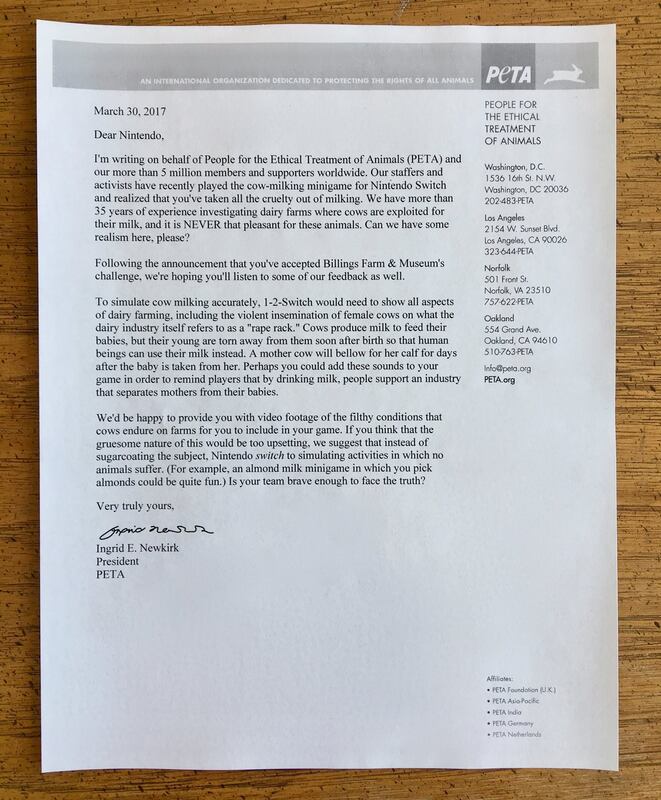 The letter, penned by Newkirk, requests "some realism," stating that "we have more than 35 years of experience investigating dairy farms where cows are exploited for their milk, and it is NEVER that pleasant for these animals." The letter also states that, in order to accurate depict cow-milking in its minigame, the game would have to show the "violent insemination of female cows," highlight the fact that "by drinking milk, people support an industry that separates mothers from their babies," and depict the "filthy conditions that cows endure on farms." "If you think that the gruesome nature of this would be too upsetting, we suggest that instead of sugarcoating the subject, Nintendo switch to simulating activities in which no animals suffer," the letter concludes. We've reached out to Nintendo for comment and will update this story should we receive a response.